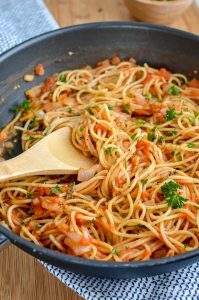 Syn Free Tomato and Garlic Pasta – simple and fresh ingredients for a delicious meal in less than 3o minutes. This is such a quick and easy meal to put together. It’s a favourite when I have nothing else prepared and the kids are hungry and I need to put together something fast. Not only is it quick to make, but it is tastes amazing. 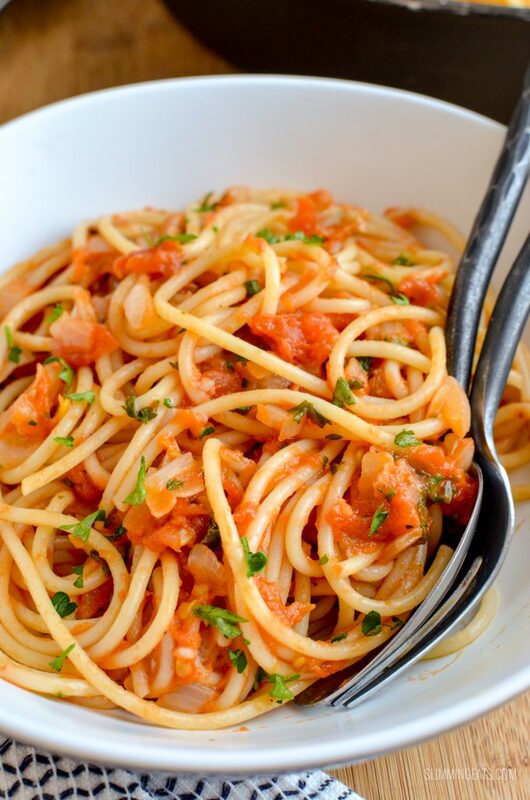 There is no better combination with pasta, than fresh tomatoes and garlic. Seriously if you have been making your sauce for pasta with canned tomatoes, make the switch now and you will wonder why you hadn’t tried it sooner. While a nice sauce can still be made with canned tomatoes, the process of canning them gives them a slightly acidic taste. 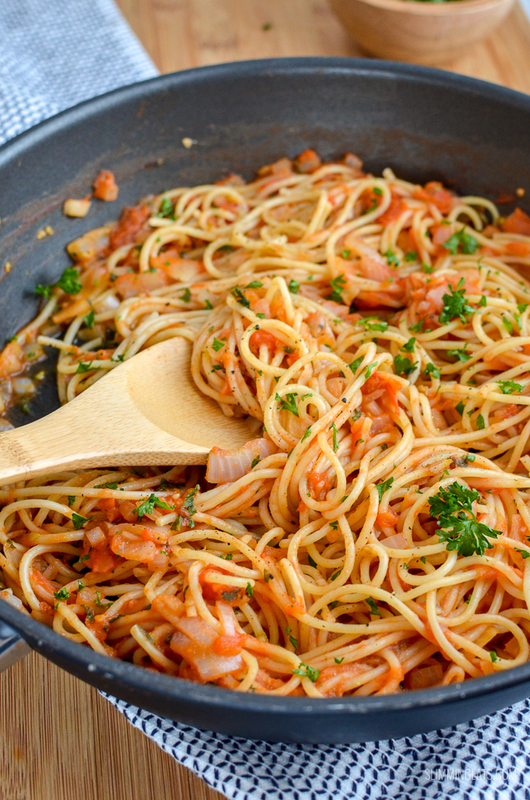 Fresh tomatoes, on the other hand, don’t have that at all, when made into a sauce like in this Tomato and Garlic Pasta, they are sweet and flavoursome, especially when matched with some garlic, onion, herbs and seasoning. I don’t even bother blanching my tomatoes to remove the skin. If you invest in a handy little peeler like this Kuhn Piranha Serrated Peeler – peeling tomatoes or any other vegetable/fruit with a soft skin will be effortless. 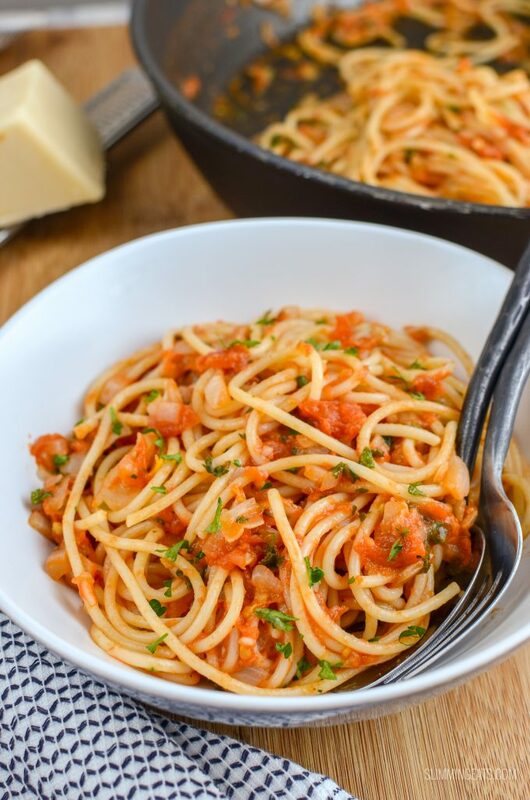 If you have a healthy extra a spare, a little-grated parmesan is perfect over this pasta dish, but don’t worry the parmesan is totally optional, this Tomato and Garlic Pasta are equally delicious without. HOW CAN I ADD A 1/3 SPEED FOODS TO THESE SYN FREE TOMATO AND GARLIC PASTA? 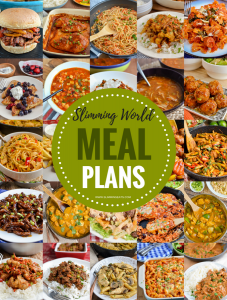 The tomatoes and onion etc will count towards your 1/3 speed foods, but to bulk out that little bit more, you could add some chopped zucchini (courgette) or have half the pasta and spiralize some veg instead. This also pairs really well with nice mixed salad. I really love baby leaves or arugula with this pasta dish. 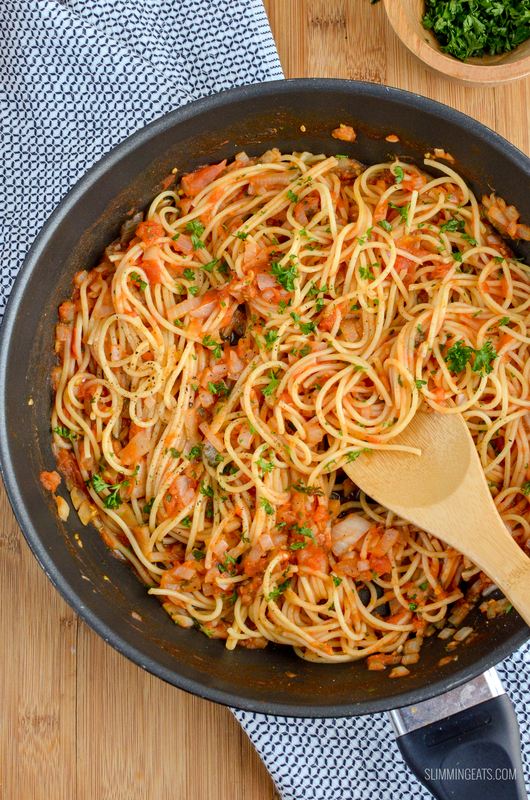 WHAT KITCHEN ITEMS DO I NEED TO MAKE THIS SYN FREE TOMATO AND GARLIC PASTA? 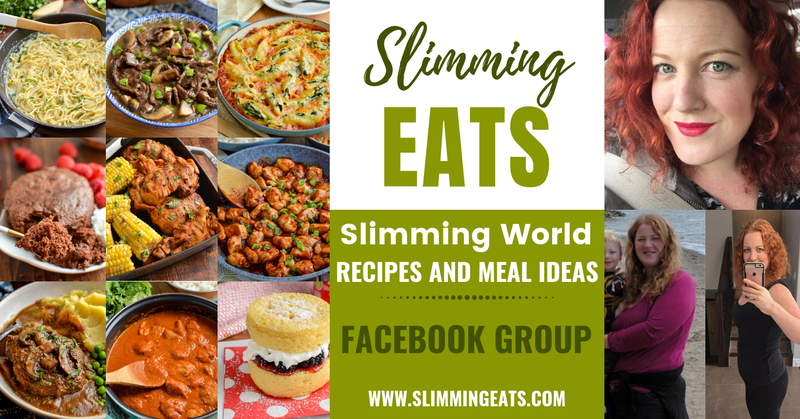 Don’t forget to subscribe to Slimming Eats to keep up to date with all new recipes. Spray a frying pan with some spray oil over a medium-high heat. Then add a little stock and continue to fry until softened and translucent. Add the garlic and fry for a further 2 mins. Add the tomatoes, a splash of red wine vinegar and a little bit of stock and simmer away, stirring every now and then until the tomatoes break down and become more sauce like. While the tomatoes are cooking, you can cook the spaghetti according to package instructions. Season with salt and black pepper, and a sprinkle of fresh chopped Italian parsley. Optional: If you have a HEA spare, you can top with some grated parmesan, or a little synned vegan cheese if vegan. 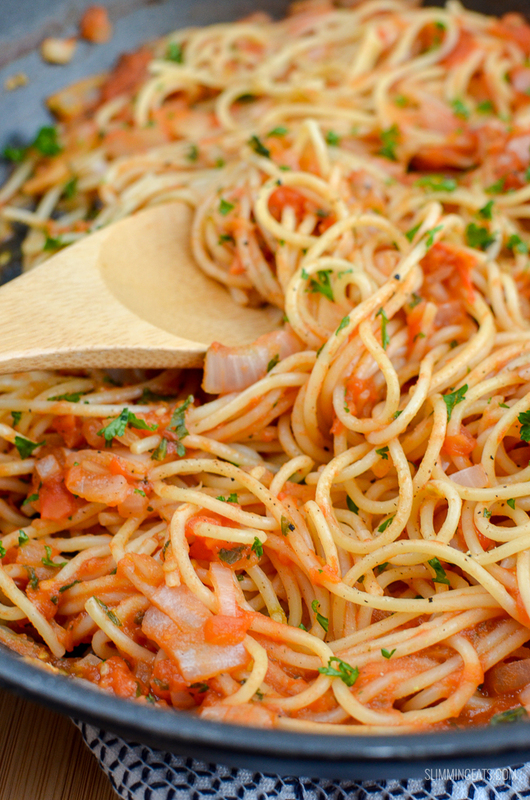 Love love love this pasta dish. So easy and so tasty…. my husband even loved it! For some reason it wouldn’t let me give 5 stars. Why at any time your recipes do not print !!!!! Sounds like you are trying to print them through Facebook which won’t work. You need to open my blog in a browser. The recipes will print fine when doing that.